The hardware components are: Teensy 3.0 microcontroller, CC3000 wifi breakout board from Adafruit, 8 x Ws2811 led strips, and 8 100ohm resistors to clean the signal line data. The setup uses the OctoWS2811 led controller software to allow the Teensy3 to drive the data to the led array quickly, and the CC3000 software to receive the incoming data for the breakout board, so that the Teesy can talk to the wifi module and connect to the wireless network. 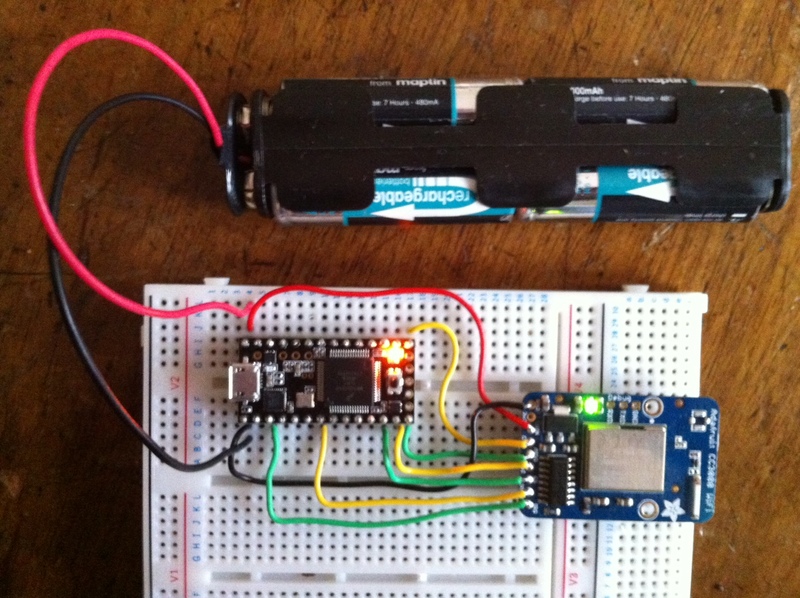 Here is an image of the basic setup using the cc3000 breakout board from Adafruit with the Teensy 3.0 micro controller. Both are able run off 5volt inputs if you want them to, as both have on board regulators to convert to 3.3v logic (hence using a standard 4xAA battery setup). The hookup of the cc3000 uses the Adafruit library with some changes. The library allows for pin changes, and in order for the Teensy to run both the CC3000 wifi board and the Octows2811 library to run the led array, I had to change some of the pins to avoid conflicts. The led array is hooked up in the usual way, using eight pins of the Teensy 3.0 or 3.1, and this is very well described on the pjrc octows2811 web page.